Actually since my husband Bob started walking just less than a week ago our lives have changed considerably for the better. The scooter has been picked up (its real name is RollerAid by Footsteps), the crutches that were always at the ready on the bottom and top floor landings and the walker that he used for help in hopping in and out of the shower are now in the garage. The only implement still in use is the boot â€“ though at his physical therapist’s advice he’s even wearing that less and less at home. Walking with the boot causes another malady â€“ an aching back, so the sooner he can walk with a regular pair of shoes the better. Who would have thought a little spill down the stairs would have caused so many weeks of pain and immobility and the need for so many helper implements? 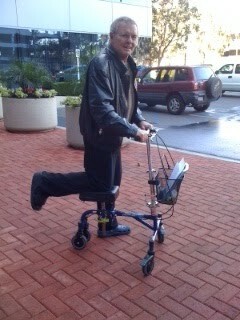 My big question now is: should I take the crutches and walker to Good Will now or wait awhile? Really, what would I be waiting for? Thank you so much. I love that it’s bookmarked.